At the Savvy Experience in August I was gifted the most beautiful hand-painted glass mug from J. Bee Designs, and was immediately terrified of breaking it. After wrapping it in dirty laundry to be sure it would arrive home safely in my suitcase, I unpacked it, washed it by hand, and put it away in the kitchen cupboard. And I didn’t use it. You see, it was hand wash only (hello, hand painted gorgeousness! ), and I hate washing dishes with a passion. So every morning, I chose a plain white mug that I could throw in the dishwasherwithout a second thought. And then the unthinkable happened. A few weeks ago, I used it, was completely delighted, and then set it in the sink to wash later (ok, secretly hoping that my husband would wash it). Instead, it ended up in the dishwasher for a hot, harsh, steamy bath. The horror! But when I pulled it out, it was just fine. That got me thinking. We don’t need to squirrel away our favorite things in drawers, cupboards and closets because we’re afraid to use them. I know I will eventually ruin this mug by putting it in the dishwasher three times a week. But that’s ok – I’ll just buy a new one when it happens, having enjoyed this one to the fullest. Cool story, Irene, but what does that mean for my brand + business? When you’ve invested in a beautiful brand + website you love, don’t be afraid to use it and get messy. If you get tired of it, you can always shift directions. If you break something, you can always call your web designer to fix it right back up. If it looks ugly, you can always change it back. You know those notecards you spent a gazillion dollars having letterpress printed? Don’t save them for a special occasion. Bust them out and write a quick note to a client, vendor or peer in business every week. Guess what? When you run out, you can always order more! Have fun with your branded patterns and textures by looking for opportunities to use them. Have custom envelope liners printed up, add them to your packaging and mailers, use them to decorate your office. Buy a pool floatie that matches, a la Reina Pomeroy, for heaven’s sake. When you get a gallery of images from an event you’ve attended or worked, use them to freshen up your website! Don’t hoard your favorite images for your infrequently-updated portfolio. Blog them, use them on your homepage, post them on Instagram. Even better, have your favorite work printed up in a lookbook – and then share it widely with potential clients and vendors. Hire an artist on Etsy to make a custom vinyl decal with your logo. Stick it on mugs. Put them in the dishwasher. Repeat as necessary. Ok, tell me in the comments. 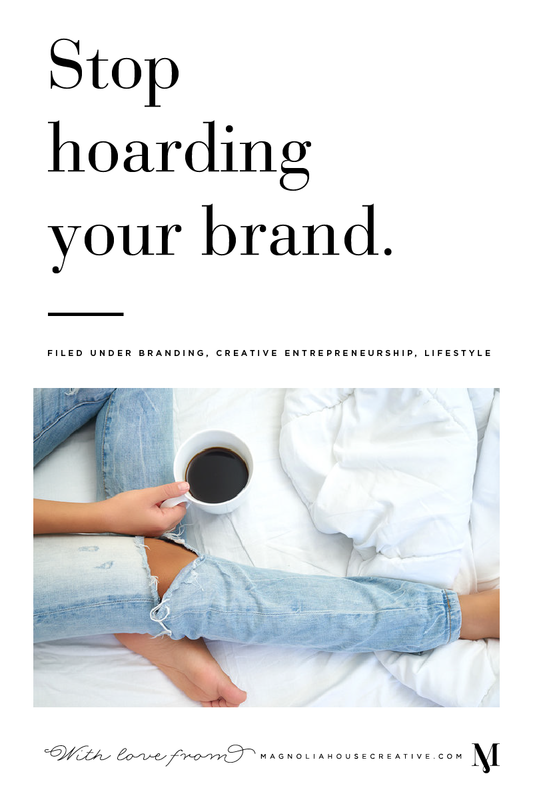 What’s one way you’re going to stop hoarding and start using your favorite things – in life, or in business?